***You can purchase an INEXPENSIVE AD-FREE PDF of the Rustic Canyon Crochet Scarf pattern on Etsy HERE and on LoveCrochet HERE! This beautifully formatted PDF includes the step-by-step pictures, granite stitch tutorial and pattern, and is a total of 5 pages including the cover page! You can also purchase a convenient kit HERE on the Lion Brand Yarn website that includes the pattern and all 7 shades of the Touch of Alpaca yarn you will need to make this gorgeous scarf! Neutral colors have always been a staple in my wardrobe as I tend to gravitate towards greys, creams, taupes and whites. In my crochet and knit designs, I usually use these neutral yarn colors as evidenced by my Granite Cape, Granite Cardigan, Granite Poncho, and Cascade Cardigan. However, I love adding bold pops of color with accessories, whether that be hats, mittens, and scarves. A couple of years ago, I noticed a good friend of ours wearing a gorgeous scarf that she had purchased in Hong Kong: it consisted of stripes of various colors, and they seemed to blend so harmoniously together. I snapped a picture of her scarf and was determined to recreate it with crochet- I just needed to search for a yarn range that had the exact colors that I needed. When Lion Brand Yarn released their “Touch of Alpaca” yarn (worsted weight- 10% alpaca/90% acrylic) with their deep and rich hues, I was ecstatic to see that they had the exact shades that I needed to recreate my friend’s scarf. As stated on the Lion Brand website, “Alpaca is similar to sheep’s wool but warmer, softer, and hypoallergenic. Our Touch of Alpaca blend offers these top qualities of natural fiber combined with durability and washability, all available in 16 stunning modern neutral & jewel tone colors.” My beautiful scarf uses 7 different colors of Touch of Alpaca: Taupe, Cream, Red, Goldenrod, Navy, Dusty Blue and Olive as pictured below. I determined how long I wanted my scarf to be with my initial chains. As a tip, I marked off every 100 chains with a stitch marker in case I lost count (the initial chain is quite large with 375 chains). 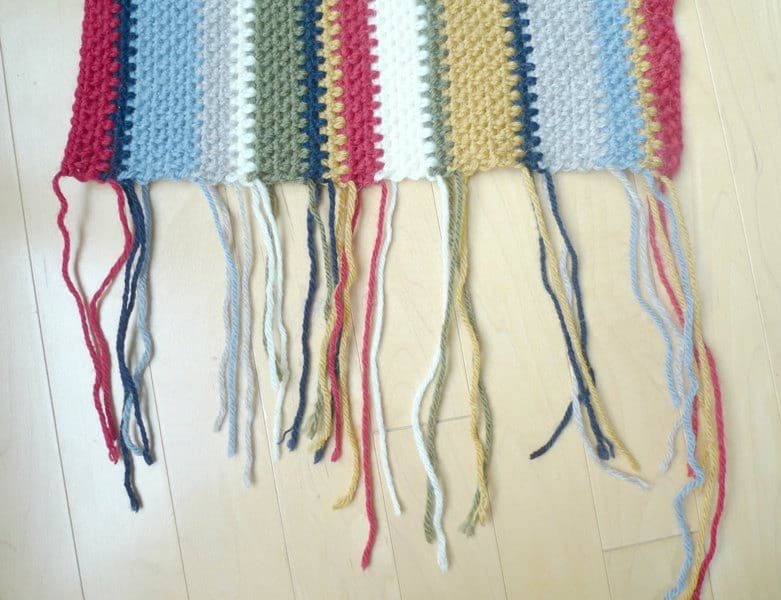 I tried to calculate how many rows I would need of each color and also leave enough yarn for fringe at the end. It was fun switching colors and watching the scarf grow wider and wider! This scarf uses the granite stitch which is a very therapeutic stitch that does not require too much concentration at all. The granite stitch consists of single crochets and chain 1’s, and the single crochets in subsequent rows are worked in the chain 1 spaces. For a step-by-step tutorial of the granite stitch, please reference my Granite Cape blog post HERE. It is very important to remember that last single crochet in the last chain space, otherwise the number of stitches will decrease row by row, and your scarf will shrink! After completing 68 rows, the crochet portion was complete! This is how much yarn was left over before I added fringe (exact weight/yardage can be found in pattern below). You can use the left-over yarn for other small projects such as amigurumi, baby hats, or headbands! Each color band is worked in an even number of rows (e.g. 2, 4, 6, 8), so all the yarn ends are left on one side. When I switched colors, I left a longer yarn end when dropping and adding a new yarn so that these yarn ends could be incorporated into the fringe later on. Thus, there is no weaving in ends at all! 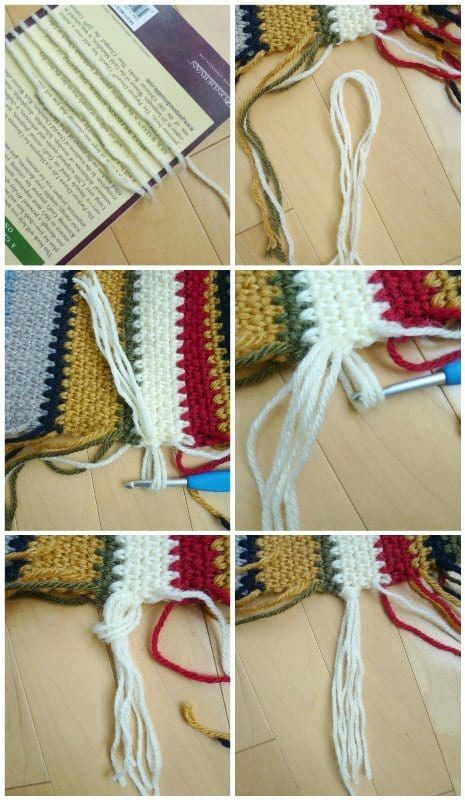 In order to create the fringe, I wrapped the yarn around a book to get consistent lengths. I took 3 strands of yarn and folded it in half. I pulled the loop through a stitch at the edge of the scarf and then pulled the ends through the loop. If there was a yarn end nearby, I incorporated it into the fringe. I was careful not to overload the edge with fringe, otherwise it would bulge out and become wider. I added a fringe bundle approximately ever 3 rows. 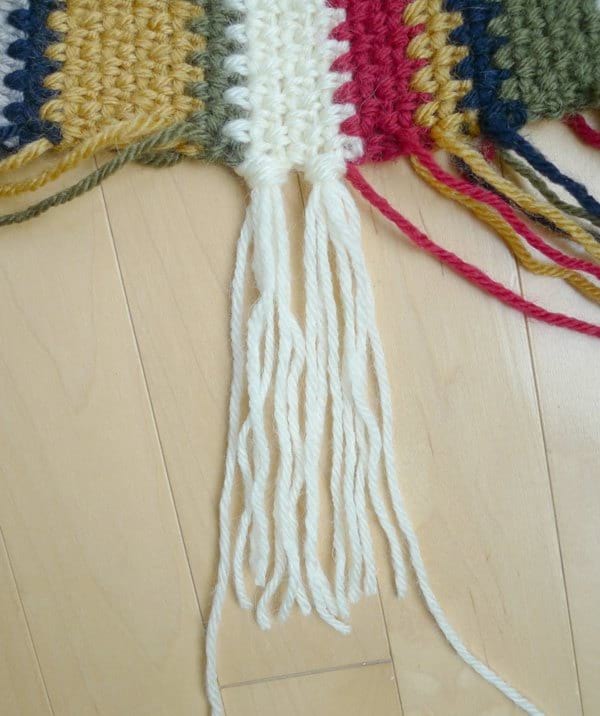 In the pattern below, I’ve written out exactly how many fringe bundles I added in each color. This is what the edge looked like after adding all my fringe! I then repeated the process and added fringe on the other edge, and then gave the fringe a trim. Switching colors: Work last stitch in old color- work as if typical single crochet until two stitches are left on the hook (i.e. insert hook into stitch or chain space, yarn over, pull up a loop). Use new color to yarn over and pull through both loops. Continue crocheting using new color. Leave yarn ends for fringe, so do not weave in the ends. 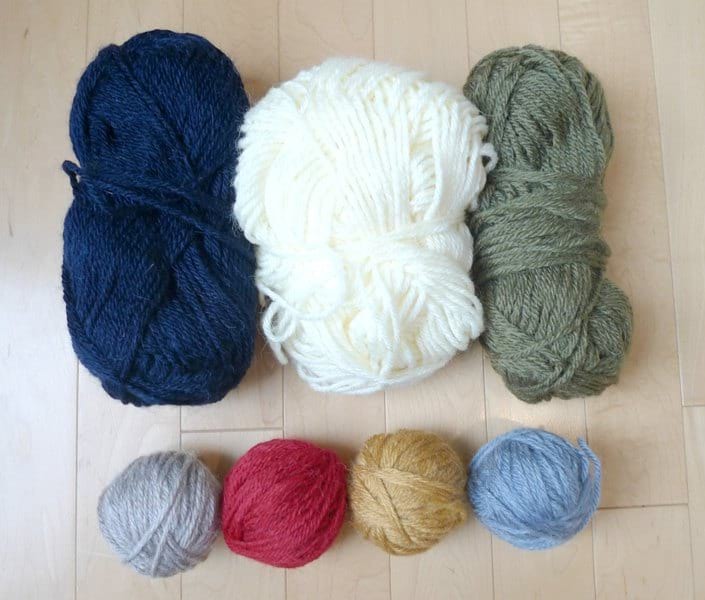 Leave at least 5″ of yarn when dropping and cutting old color and when adding new color. Each block of colorful rows is worked in an even number, so fringe/yarn ends will all end up on one side. 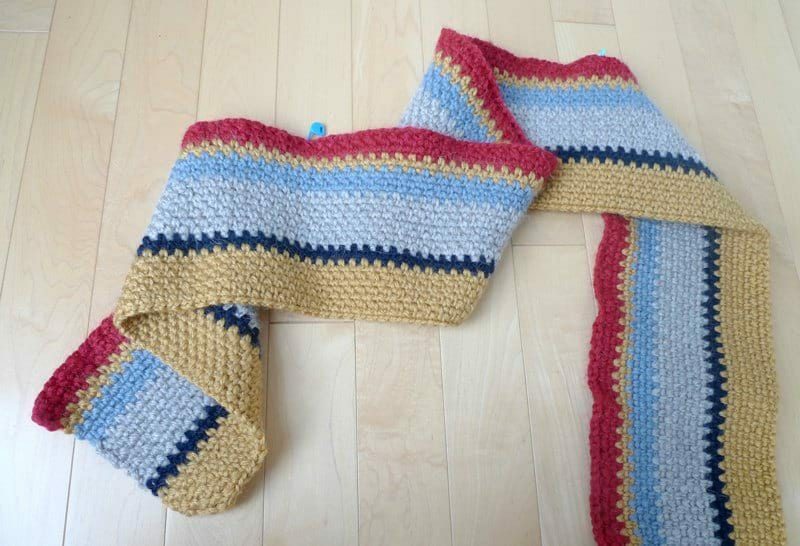 To make the scarf wider, add more rows. To make the scarf longer, add more initial chains. Fringe or tassels can be added to ends of scarf. When working initial chains, you can mark off each 100 chains with a stitch marker in case you lose count (e.g. 100, 200, 300). Do not forget to work the last sc of each row in the last chain space at the start of the previous row, otherwise the number of stitches will decrease row after row. Using 5 mm hook, chain 375 (use an odd number of stitches). R2: Ch 2, turn. Sc in the next ch 1 space. *Ch 1, sc in the next ch 1 sp* until end, finishing with a sc in the last chain sp at the start of previous row. Fasten off and leave end for fringe. Cut 12″ strands of yarn (you can wrap yarn around a book to get consistent lengths). Make bundles of yarn consisting of three yarn strands (resulting fringe bundle will have 6 ends once they are folded in half). Fold yarn strands in half. Pull folded loop through edge of scarf. Pull ends through loop and continue pulling. Repeat across. Trim fringe as needed. Incorporate the yarn ends left from changing colors into the fringe. 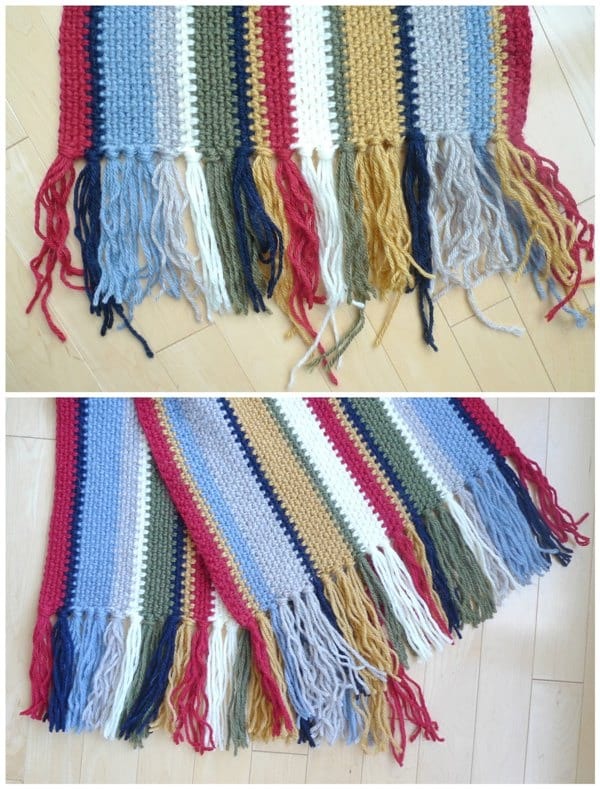 Add a bundle of fringe in the corresponding color for approximately every 3 rows. Do not overload the edge of the scarf with too much fringe otherwise it will bulge out or stretch too much. My edge consisted of the following fringe bundles: 1 Red, 1 Navy, 3 Dusty Blue, 1 Taupe, 1 Cream, 2 Olive, 1 Navy, 1 Goldenrod, 1 Red, 2 Cream, 1 Olive, 3 Goldenrod, 1 Navy, 3 Taupe, 1 Dusty Blue, 1 Goldenrod, 1 Red (25 fringe bundles in total). I decided to name this beautiful piece the “Rustic Canyon Crochet Scarf” because I wanted a name related to these rich and earthy tones I used. It evokes an image of the countryside with the fields of wheat, barley, and maze or the different layers and surfaces of a canyon. I love how each stripe is of varying widths as it adds so much visual interest! Ryan had the idea to do this dramatic throwing the scarf pic, and I love how it turned out! Look at that flying fringe taking on a life of its own! This scarf looks so chic and is such a classic and bold statement against a neutral jacket. It is long enough to be looped around the neck once for an extra cozy feel! 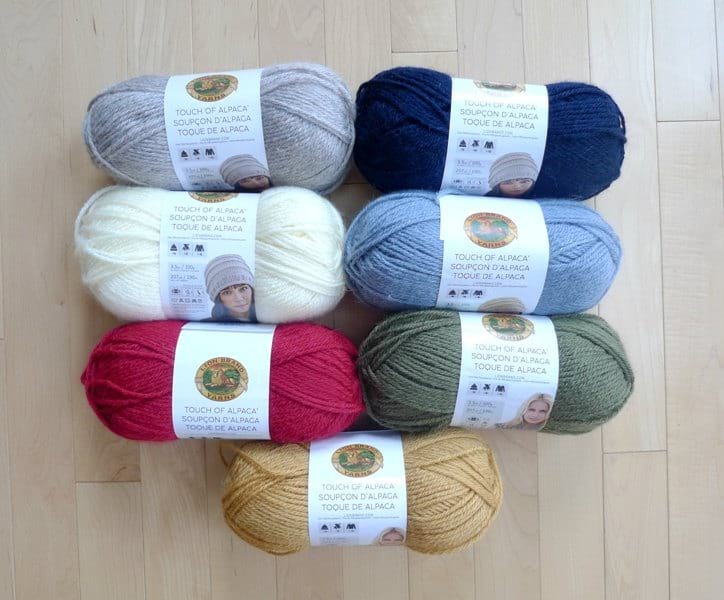 This alpaca blend yarn is very warm and is washable as well. I’m so glad this range happened to have the exact colors I needed to crochet this colorful piece! I will be sporting my Rustic Canyon Crochet Scarf throughout the fall and winter, and hope you are interested in making one too! I am thrilled that you can purchase a convenient kit HERE on the Lion Brand Yarn website that includes all 7 shades of Touch of Alpaca yarn that you will need to crochet your own Rustic Canyon Scarf. These colors blend so harmoniously together, and the kit makes it very convenient since you do not have to hunt down individual colors. I had so much fun playing with color with this project as it is something that I do not do very often. The last time I used such a wide variety of colors was for a blanket, so it is amazing using such a range of colors for a wearable item! Needing to weave in ends when working with so many different colors can be tedious, but I LOVE how no ends to be weaved in for this piece since they’re all incorporated into the fringe! Switching up the colors keeps this project very interesting and fun as you look forward to working the next color stripe and seeing the beautiful design grow and grow! I hope you enjoyed reading about the inspiration and making of my Rustic Canyon Scarf- enjoy playing with color, everyone! Keep up to date with my work through my e-mail newsletter HERE! 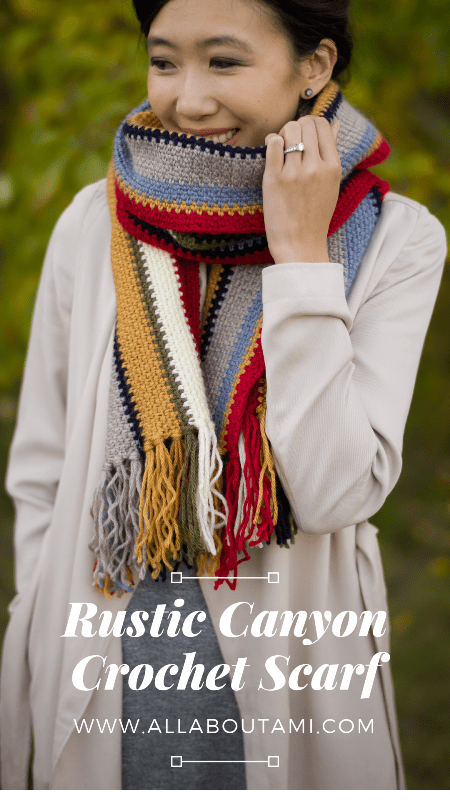 And if you make your own scarf, you can use the hashtag #rusticcanyonscarf on social media so we can all see!